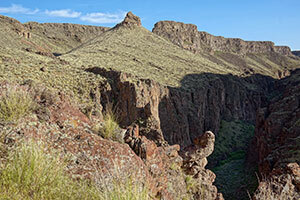 Library image #3794: Canyon in Big Jacks Creek Wilderness at Cottonwood Creek. The United States Congress designated the Big Jacks Creek Wilderness (map) in 2009 and it now has a total of 52,753 acres. All of this wilderness is located in Idaho and is managed by the Bureau of Land Management. The Big Jacks Creek Wilderness is bordered by the Little Jacks Creek Wilderness to the northwest. The Big Jacks Creek Wilderness, in the Big Jacks Creek Basin, consists of rugged canyons, streams and plateaus that provide habitat for redband trout, mountain quail and bighorn sheep, as well as two sensitive plant species. The basin ranges in elevation from 2,808 to 5,872 feet and drains a sagebrush-covered plateau dissected by rugged, sheer-walled canyons that are as much as 650 feet deep. Big Jacks Creek flows north into the Bruneau River, a tributary of the Snake River. The basin is covered by big sagebrush, low sagebrush, salt desert shrub, and riparian vegetation communities. The sagebrush communities are most common; low sagebrush types are found primarily on shallow, poorly drained soil, and big sagebrush types are associated with deep, well-drained soils. The big sagebrush community is dominated by Wyoming big sagebrush and bluebunch wheatgrass, and the low sagebrush community is dominated by black sagebrush, low sagebrush, Thurber needlegrass, Idaho fescue, and bluebunch wheatgrass. The salt desert shrub type grows on poorly developed soils in northern part of the basin and consists of shadescale, bud sagebrush, and Indian ricegrass. Lush riparian vegetation grows along perennial reaches of the creek and generally includes shrubs of willow, rose, and currant as well as sedge and bluegrass in meadow areas. Two hiking trails give access to the Wilderness: the 3-mile round-trip Big Jack Creek Trail and the 2.5-mile round-trip Parker Trail. Planning to Visit the Big Jacks Creek Wilderness? How to follow the seven standard Leave No Trace principles differs in different parts of the country (desert vs. Rocky Mountains). Click on any of the principles listed below to learn more about how they apply in the Big Jacks Creek Wilderness.